Dig up some family fun with Lucy's Expedition, an original time-management game from the creators of Little Shop - Road Trip! When pieces of a mysterious map begin appearing around the world, it's up to Lucy Livingston to track them down. 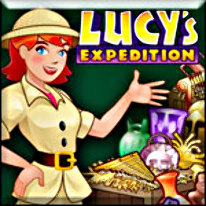 Help Lucy and her team travel the world on their quest for ancient artifacts to trade for the map pieces. Flex your memory muscles for extra funding between levels in a fun mini-game. And don't forget to watch out for evil Nigel Gneaugood! He's out to cause trouble by stealing your supplies and even the artifacts you discover! Featuring a new and innovative theme, gorgeous full-screen graphics, and addictive gameplay, you'll discover an adventure full of fun in Lucy's Expedition!